Advocates for ALS awareness visited Harrisburg today to talk about the devastating impact of the disease and the need to find a cure. 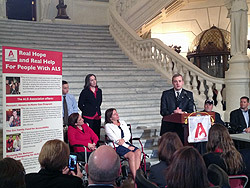 Rep. Bryan Cutler (R-Peach Bottom), who has been a long-time supporter of ALS awareness, spoke at the event in the Capitol Rotunda. HARRISBURG – The House of Representatives today unanimously approved legislation authored by Rep. Bryan Cutler (R-Peach Bottom) to raise awareness of Amyotrophic Lateral Sclerosis (ALS), commonly referred to as Lou Gehrig’s disease, by designating May as ALS Awareness Month in Pennsylvania. Cutler’s House Resolution 209 explains the devastating impact of the disease, which most commonly occurs in adults between the ages of 40-70. Men are more likely to be diagnosed with ALS than women. Approximately 5,600 new ALS patients are diagnosed each year. Most individuals diagnosed survive for only two to five years. ALS attacks nerve cells and pathways in the brain and spinal cord, taking away an individual’s mobility and voluntary muscle control. Scientists still do not know what causes the disease and there is no known cure or means of prevention. To date, there is only one Food and Drug Administration approved medicine to treat ALS, and it was released on the market in 1995. More information about Cutler and his legislative priorities is available at www.RepCutler.com and www.Facebook.com/RepCutler.